Will, Steve, and John, The Partygoers The Partygoers are a three-member group of San Franciscans dedicated to "spreading goodwill through the spontaneous visitation (sic) of social gatherings and celebrations." They're party crashers - but wait! With the idea in mind that San Francisco can never have too many characters, the Partygoers' aim is to put themselves at the head of the personality parade. 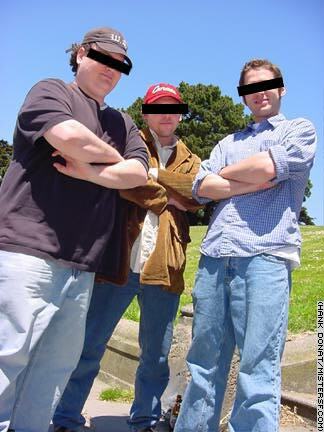 They appeared in the San Francisco Chronicle just weeks after launching their entertaining web site, which documents the dozens of parties they've visitated and explains how you, too, can ingratiate yourself to the host or hostess who might not know you from Adam or, for that matter, Eve. The Partygoers are Will, Steve, and John, members of the City's creative community (design, advertising, film) whose interest in San Francisco and regular San Franciscans compels them to get in on the fun. For Steve, just finding a party is the best part of a Partygoers adventure. "If you want to tip us off to a party," he says, "just tell us where it is in a five block radius." By all accounts a pleasure to revel with, the Partygoers don't steal and they don't try to cause any other trouble when making the scene. "If someone asks us to leave we go right away," says Will. "We listen for names on the way in," John adds, "One time this lady asked us who were were and I said, 'Oh, we're with Mary.' She said, 'I'm Mary.' So we left."